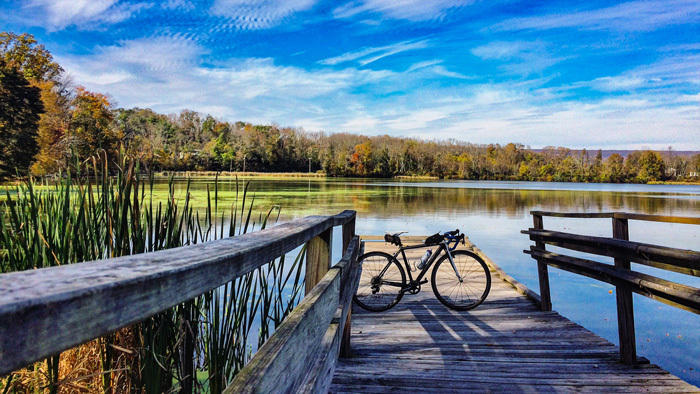 Defined by scenic, rural countryside, Warren County may lack the bike-friendly infrastructure of the more populated parts of the state that are striped with bike lanes, paved paths, and easy access to public transportation. But tucked away in the seemingly endless landscape of ridge, valley, and wooded hillside is an incredible bicycle-friendly network of quiet back roads linking together small towns and historic villages, repurposed rail trails creating pastoral off-road adventures, and miles of single track trail tracing through the rocky upland forests. Beginning in the county’s northernmost reaches in the Delaware Water Gap National Recreation Area, Millbrook Road offers cyclists an impressive climb up the side of Kittatinny Ridge. From the start at historic Old Mine Road, the paved road climbs over 600 feet — at times sustaining a 13% grade — with plenty of scenic views to distract from the hard effort! After crossing the Appalachian Trail, the road descends into Hardwick and Blairstown, where a myriad of small back roads zigzag down the hillside. At the bottom of the ridge the eastern end of Stillwater Road passes White Lake and offers a number of shady and winding roads such as East Crisman, Primrose, and Henfoot by which to explore the route of the Paulinskill River into Blairstown, a perfect spot to refuel with fresh, locally-sourced food at the eateries on Main Street. Across the somewhat busier State Route 94, Silver Lake Road offers a mild climb with a sweeping vista across from Genesis Farm. From here cyclists can link together Kerr’s Corner, Union Brick, Locust Lake, and Swayze Mill Road to form a rewarding route through pleasant countryside. For those seeking a less hilly off-road tour, just look for the monolithic concrete Viaduct on Station Road that marks the western edge of the Paulins Kill Valley rail trail, a 26-mile-long converted railbed passing through Hainesburg, Blairstown, and beyond into Sussex County. The trail becomes narrow in spots but consists of a packed cinder and crushed stone surface, ideal for touring, hybrid, or mountain bikes. Mostly wooded, the trail follows the river, edging fields and farms and passing through Blairstown Airport where a stop to watch the colorful planes take off is always rewarding. Heading south, the Jenny Jump mountain range forms an abrupt edge to the wide Paulinskill valley, and a winding paved road takes cyclists from the bottom of County Route 519 in Hope up State Park Road for a three-mile-long climb through open farm and state forest. For the less altitude-inclined, the Great Meadows area offers a beautiful place to pedal the long stretch of fertile farm and sod flats. The storied Shades of Death Road follows the southern edge of the mountains here, with views of the sod fields opposite the steep wooded slopes of Jenny Jump Mountain. A relatively flat paved loop can be made with Shades of Death Road connecting Gibbs, Long Bridge, Quaker Church, Ervey, Greendell and Bear Creek Road for a tranquil ride through the heart of Warren County’s unique farm country. This is a popular destination ride on any nice day in the warmer months, and the Allamuchy Elementary School even offers a “Cyclist’s Parking” section across from Alphano Road. Following the Pequest River south from the Great Meadows, the ridge of Upper Pohatcong and County House Mountain begins to rise in the distance. No longer flat farmland, Pequest Road and Route 46 (a quieter section of the highway) are the easier stretches of road to traverse here. A curving, wooded hill climb awaits the adventurous road riders up Janes Chapel Road, with a rustic old woods track called Cary Warren Road ascending the mountain further west towards Oxford. Following along the Pequest River, the Pequest Fish Hatchery and surrounding Wildlife Management Areas dominate the landscape, with open fields and wooded riverbanks creating a paradise for hunters and fishers — and cyclists too. A five-mile stretch of abandoned railway has been repurposed into a multi-use trail along the river, and while its surface is not as well maintained as some area rail trails, it creates an interesting riverside ride for knobby-tired bikes, with many posts and signal boxes from the old railway intact, over a few wooden bridges and past remnants from the old Pequest Furnace operation. Further west a one-mile stretch of the fabled Warren Railroad, now a fairly well maintained flat cinder path, passes from Rt. 519 near Hope Crossing Road to Upper Sarepta Road, where a rolling network of very quiet back roads can be accessed by climbing up Mutton Hill to a vista overlooking Oxford, Belvidere, and the mountains beyond. Sarepta Road continues north back to Hope and Knowlton, where a low-traffic, ambling network of roads offers a variety of cycling terrain: flatter sections of Delaware, Nightingale, Kostenboder, and Knowlton Road wind their way rural farm fields while the hills of Honey Run, Lime Kiln, and Linaberry Road offer sweeping views of the surrounding Jenny Jump ridge and the Delaware Water Gap. 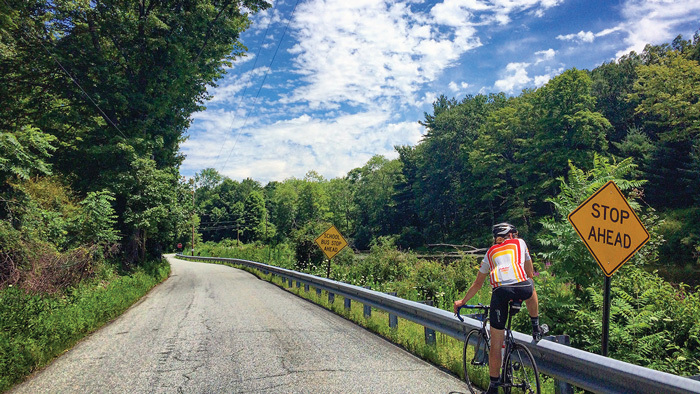 The Victorian town of Belvidere on the Delaware is an excellent place for out-of-towners to start a ride, with easy access to these routes in Knowlton, Hope, and Blairstown. Mountain Lake, although a county road, offers a moderate climb from Belvidere past a picturesque lake community and the last rise of the Jenny Jump ridge. Intriguingly named roads like Free Union, Lake Just-It, and Quemby Mountain wind up and down the hillside offering a robust workout with very little traffic. South from Belvidere, Foul Rift Road follows the Delaware River for a rolling but mellow road ride that is perfect on a summer day. Ending across the river from Easton at the north edge of Phillipsburg, Foul Rift/River Road makes an excellent out and back ride of twenty-five miles or offers a gateway to the many formidable hill climbs over Montana Mountain to the east. Fiddler’s Elbow, Wester, Decker, Lommason Glen, and Buckhorn are road names the avid cyclist will remember for their steep and winding ascents, with some grades reaching over 20%! The reward at the top of Montana Mountain is certainly worth the effort: wonderfully open rolling farm roads traverse the area from Summerfield to the scenic overlooks of Merrill Creek Reservoir and Low’s Hollow. The other side of the mountain offers a number of long paved descents including Montana, Millbrook, and Coleman Hill Road — best for those with well-adjusted brakes! Riding into Phillipsburg, River Road becomes South Main Street, passing through the historic and busy thoroughfare of this old Morris Canal town. The patient rider seeking open space will be rewarded with a sharp right under an impressive rail bridge onto Carpentersville Rd, which rises through farm fields to the Finesville valley. 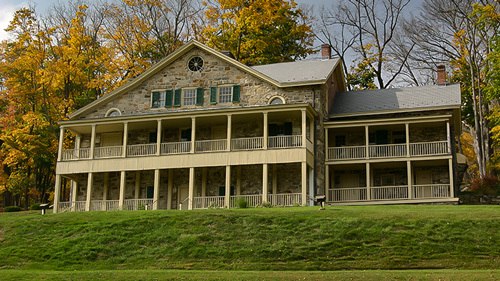 A peaceful loop of Creek, River, Municipal and Ravine Roads can be made to follow the course of the Musconetcong Valley, passing unique farmsteads, old railroad tunnels, and a section of dirt road offering a nice spot to enjoy the river. South Main Street leads towards the charming “downtown” of Stewartsville and offers a lower-traffic alternative to the busier shopping area of Greenwich Twp. along Route 22. The Musconetcong River then defines the southern border of Warren County, and following it upstream reveals the pastoral landscape of Asbury Valley. Heading east out of Stewartsville, Asbury-Anderson and Mountain View Road are popular with road cyclists and feature wide views of the agricultural valley. There are several steeper climbs to ascend the ridge towards Broadway, although less steep than the longer roads up Montana Mountain to the north. 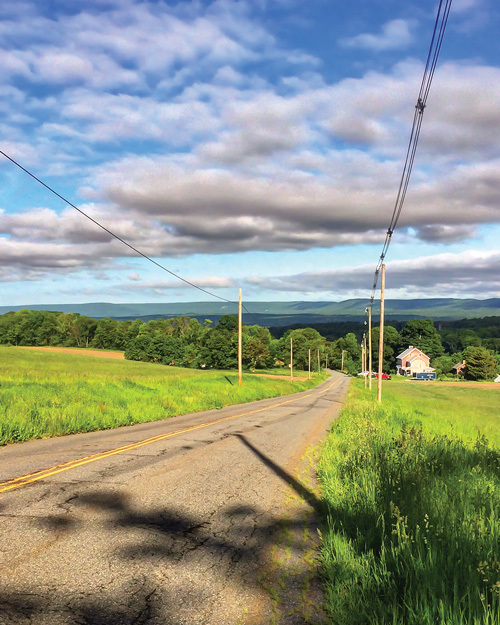 Past Washington, Jackson Valley Road is a favorite road among area cyclists providing wide views of the Oxford ridge before curving through pine and hardwood forest and climbing alongside Pohatcong Creek. Rockport Road is a flatter and open road connecting Washington and Hackettstown. Many road cyclists will use this road heading out of Hackettstown as a gateway to the rolling hills beyond. Beyond Hackettstown lies Warren County’s mountain bike paradise: the vast network of trails through Stephens State Park and Allamuchy State Forest. Hidden along the ridges and rocky hillsides of Waterloo Valley are over seventy miles of single-track trail offering an immersive experience in challenging and scenic terrain, with parts of the parkland entering Sussex and Morris counties. 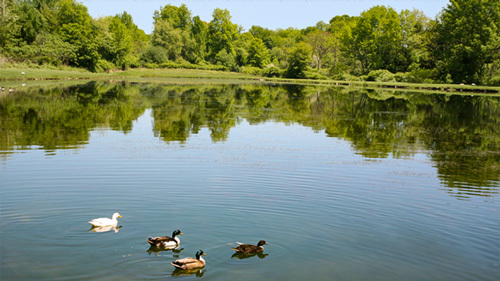 Named after the game preserve once operated by Rutherford Stuyvesant, the Deer Park section lies squarely within Warren County lines and is an excellent place for new or seasoned mountain bikers to enjoy quintessential North Jersey terrain. From the first parking lot at the end of a narrow dirt lane off of Route 517, a fast flowing, single-track trail hangs left over a clear creek crossing, ascends a switchback up a rock escarpment, and quickly descends through tight turns back to the main white-blazed trail — a perfect trail experience in less than one mile. The white perimeter trail follows the rolling contours of the wooded park through easier terrain, eventually crossing two man-made bridges and opening up to the pine flanked Deer Park Pond. A wider woods road will take the weary rider back to the parking lot with less difficulty, but there are still several miles of single-track to explore birch woods and fern-lined glens. Deer Park is bound on the north by Interstate Rt. 80, cutting it a bit short, but there are plenty of trail offshoots and options to make it a local favorite. Allamuchy “North”, as the section of state park above the Interstate is referred to, features a deep woods feel that will have you checking and rechecking your coordinates! Technical rockface trails like Lumpy Bumpy and Ice Cream provide challenging descents for advanced riders, and long rambling single-track climbs like Cardiac and Waving Willie offer slightly less rocky terrain. 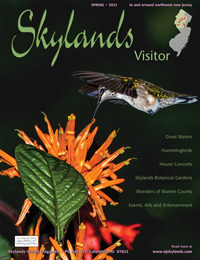 Stephens State Park borders the eastern length of Waterloo Road, with the campground and visitor center located directly outside of Hackettstown. A more varied, intermediate-friendly group of trails takes riders from the lower area along Waterloo Valley Road to the upper ridge of Mount Olive with flowing trails like The Maze and the Trestle loop near scenic Tilcon Lake, and an extensive maintained network of white, blue, green, and purple blazed trails snaking up the mountainside. Intrepid riders looking for a whole day challenge can link up the three parks for a multi-hour ride, crossing only two paved roads to experience miles of incredible single-track worthy of a destination ride. Thanks to the work of local Jersey Off Ride Bike Association (JORBA) volunteers, the Allamuchy area trails remain a well-kept paradise showcasing the rugged terrain of Warren County. Marty’s Bike Packing Weekends, June 2-3, July 14-15, August 18-19, October 5-7. Riders carry gear on their bikes for an overnight group trek to a campsite. Trips range from twenty mile trips on the rail trail to a challenging, two-hundred mile, three-day expedition through hilly terrain. Click or call Marty’s Reliable Cycle at 908/852-1650 or email megan@martysreliable.com for more info. Tour de Blairstown, August 4. 25-, 40-, and 62-mile route options provide varying challenges for all levels of cyclists. Gran Fondo NJ, Sept. 9. 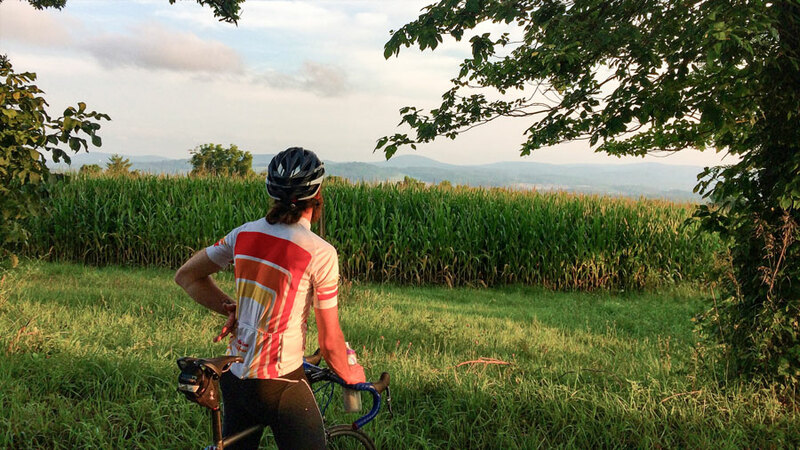 A variety of route options take cyclists on an epic ride from Morristown through Morris, Hunterdon, and Somerset counties. Tour de Farm, Sept. 22. Enjoy a delicious locally-sourced breakfast before you bike from farm to farm in the Blairstown area, enjoying fresh produce and treats at each stop.